TRADER 9: Trade of the day, RNA!!! 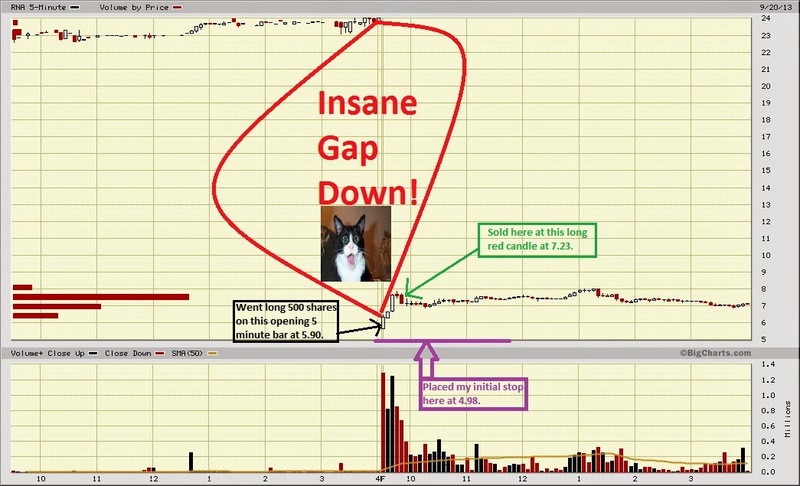 RNA was a gift on Friday morning for those traders who played the gap down. Twitter, Stocktwits, and other trading message boards were going crazy about buying RNA on the open for a quick bounce. I decided to follow the crowd on this one and went long 500 shares of RNA at the open at got filled at 5.90. Also I went ahead and placed a stop at 4.98 because I saw a huge 100,000 shares bid on my level 2 screen. Didn't know if it was a real or fake bid, but gave myself a .02 room just incase it started to fall any farther than that (5.00). Anyways, sold RNA at 7.23 for a $665 profit when it seemed that the short term opening bounce was done. Not bad for 30 minutes of work :-) .